Emily Cohn/Tech InsiderYou can now control your Sonos speakers on the iPhone lock screen. I love my Sonos, but one thing that’s irked me since I got the Play 1 speaker earlier this year was that I couldn’t control it from my iPhone when my phone was locked. 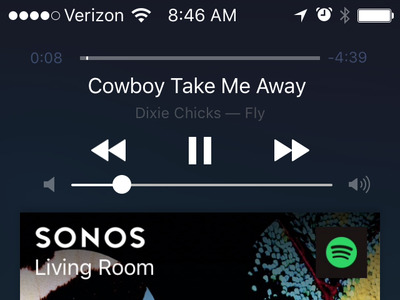 Unlike other music apps like Apple Music and Spotify, which can be controlled on the iPhone’s lock screen, Sonos required you to unlock your iPhone and open the Sonos app each time you wanted to skip a song or adjust the volume. But last week, Sonos gave iOS users much to celebrate. The latest version of the Sonos Controller app features lock screen control for iPhone and iPad users (Android users have had this for a while). The new update also adds some new 3D touch functionality for the iPhone 6s or 6s Plus and Split View and Slide Over controls for the iPad, which will make it easier to control your Sonos while using other apps. Lock screen control is definitely what we’re most excited about. Sonos users have been asking for this feature for a while.